Fans of Marvel Comics know that when Mark Waid and Chris Samnee first began working together on Daredevil back in 2012, they were making something special. The series earned widespread acclaim, as well as earning Samnee an Eisner Award the following year. So when their time on the title came to an end in 2015, the two made a choice. Together with colourist Matthew Wilson and letterer Joe Caramagna, the team decided they wouldn’t be parting ways, instead opting to find a new solo character series to work on. 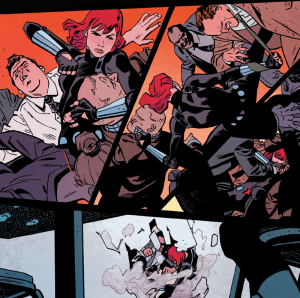 That series is Black Widow, one of the most anticipated titles of the All-New, All-Different Marvel lineup. The first issue opens with a bang—an announcement from Maria Hill, Director of SHIELD, that Natasha Romanoff is to be considered an enemy agent. What follows is a long chase, punctuated by short, intense fight scenes, as Black Widow attempts to escape from a SHIELD Helicarrier currently in the skies above New York City. Mark Waid and Chris Samnee have brilliantly plotted their first issue, choosing to introduce readers in the middle of the chase and keeping everything moving at a fast pace. It’s an issue focused on setting up the series, without bogging down the reader with too much exposition. There’s sparse dialogue throughout the issue, with Widow only saying two words by the end of the story. It’s may be a little disappointing for the readers that wanted to see how Waid will be approaching the character, but the issue works well to set up the first story arc. What the book lacks in words, it makes up for in the art. Samnee and Wilson deliver some amazing panels in the first issue, handling the majority of the characterization through facial expression. Samnee captures the sense of motion associated with the character, depicting her hopping through the panels with unparalleled grace as she dispatches a number of pursuers. The page layouts work to capture the scale of the conflict, contrasting the small panels of the fight scenes with the wider shots of Widow moving through the world. There’s a lot of action happening on the pages, but smart layouts and visual cues keep the book from feeling overwhelming. The colouring of the issue deserves special mention as well. Wilson has built his colour palette around red, accenting important panels with the colour. The choice works well, delivering stunning panels built around the character. 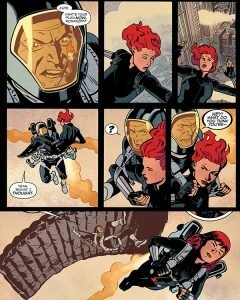 There’s a page where Natasha is leaping through a fire, red smoke engulfing her, that is easily one of the most beautiful of the issue. The artist and colourist are in sync, creating some of their strongest work. Though the lack of dialogue was a little disappointing, the plotting is tight and the art takes care of all the characterization needed for a first issue. 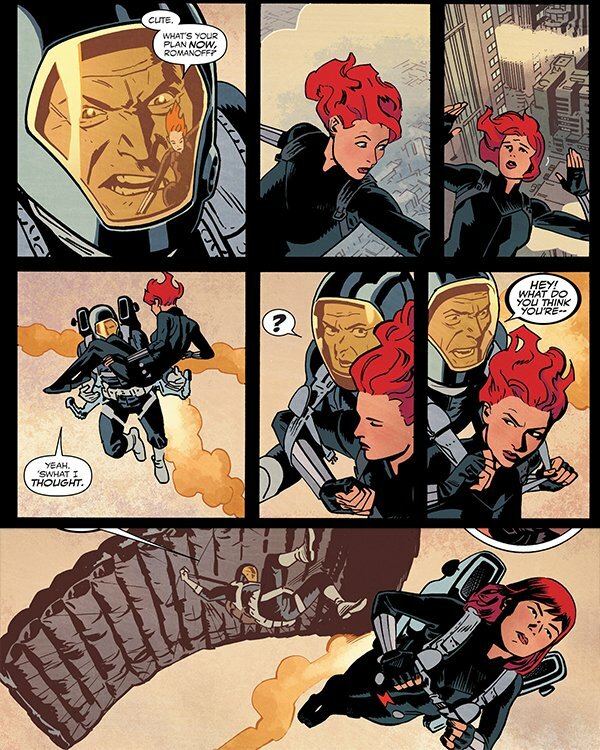 Black Widow #1 is a spectacle, one that absolutely warrants a look from any comic reader. Time will tell if the team can deliver another series on the level of Daredevil, but this issue shows they’re on the right path. 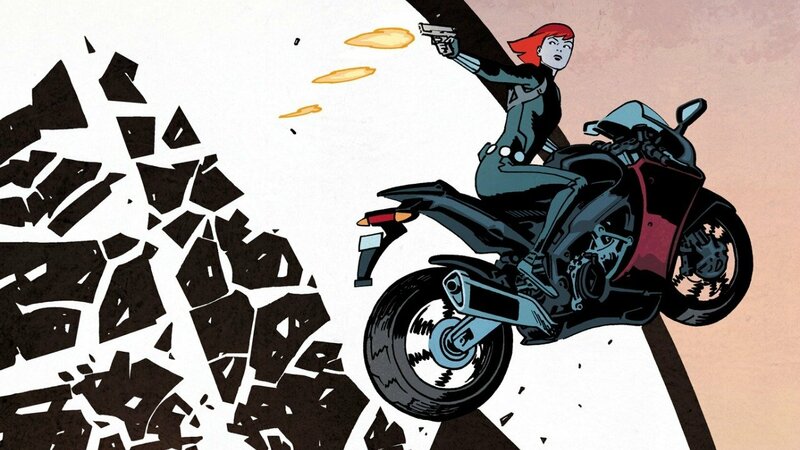 That series is Black Widow, one of the most anticipated titles of the All-New, All-Different Marvel lineup.